At 20:00 on Friday 16 March 2012, Friday in the Third Week in Lent, the Sodality held a Missa Cantata at Our Lady of the Rosary Catholic Church, Blackfen. The Celebrant was Fr Timothy Finigan, Parish Priest, who is the new Spiritual Director of the group. The celebration of Holy Mass followed Stations of the Cross, which took place from 19:30 as part of the church's normal routine. The Schola sang the Mass Humiliavit: this rich Mass, known as the Golden Mass, was first 'revealed' in the year 532 to Pope Boniface II and was believed to have been composed by St John the Evangelist himself. Fr Finigan gave a wonderful and captivating homily about the joy of participating in Our Lord's suffering and the value of devotion to the Passion and particularly to the Five Holy Wounds. 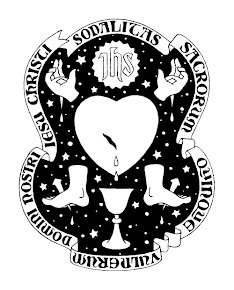 Following the final Gospel, our Sodality Prayer – the Prayer before a Crucifix (En ego) – was recited; on this occasion, being a Friday in Lent, this prayer carried with it a plenary indulgence. Refreshments were served after Mass and discussion was lively about future meetings and a forthcoming pilgrimage. Several new attendees expressed interested in joining the Sodality and their details will now be entered into the register.